I recorded this last night after the Urban Fatburner one, it’s an app I first demoed on the Nokia N900, and I thought it would be quite fitting to demo it again on the Nokia N9. Take a seat in the Air Traffic Control tower! Guide big airplanes to one landing strip and small planes to the other one. 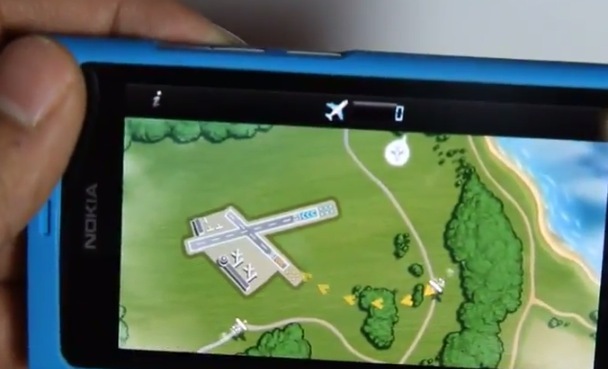 Draw landing routes towards the landing strips and avoid collisions! It’s a fun app where you’re the control tower and you organize the flight and landing plans of the planes coming to your airport. Large planes go to the longer runway and the smaller planes go to the smaller runway. You just trace a path with your finger and direct them to the appropriate runway. As the game progresses, more planes come and you have to orchestrate many paths ensuring no collisions otherwise, game over. I wasn’t paying attention to the game properly as it was hard to see it through the viewfinder of the camera. It plays well enough though it is a slight more fiddly than the N900 with a stylus (and you can trace much more elaborate courses more easily). Not much has changed except for the fact you can swipe this game away. I did wonder why in some games swipe seems to have been disabled unless I press pause, now it kinda makes sense as I’m often accidentally swiping parts of the game. I guess that just takes practice and getting used to it. You can of course instantly resume if you ever do fully swipe it into the multitasking cards.